Scientists at the Roslin Institute near Edinburgh, where she was born, say she was put down after developing a lung disease. Under normal circumstances, sheep can live for 10 to 16 years - so at six she was relatively young. Coming only a week after the sudden death of the first sheep cloned in Australia, it is bound to raise fresh fears about the wisdom of cloning. In December, the company, Clonaid, claimed to have created the world's first cloned baby but has failed to provide any proof. The claim was met with outrage as most experts believe any attempt to bring a human clone into the world would be foolhardy and dangerous, given the limited success in animals. The man who led the team that cloned Dolly, Prof Ian Wilmut, has always spoken out against human cloning. Many believed something as complex as a sheep could never be cloned. It took hundreds of attempts to produce Dolly and, even now, the cloning process is far from perfect. Several domestic animals - including the cow, goat, mouse and cat - have been cloned but many die before birth or are born with severe abnormalities. This had led to concern that even clones which appear healthy may in fact have underlying genetic abnormalities. Indeed, research suggests that Dolly may have been susceptible to premature ageing. She was created using DNA taken from an adult cell, in this case the udder of a ewe. Just over a year ago, she developed arthritis, a disease that could have been caused by the cloning process. Until then, she had shown no signs of ill-health and had given birth to four healthy lambs. A full post-mortem is being carried out on Dolly which should reveal more about how she died. 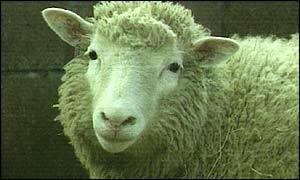 Scientists at the Roslin Institute say lung infections are common in older sheep, so her death may mean nothing at all. Many scientists, however, will be hoping the results of the post-mortem shed fresh light on the safety of cloning and perhaps deter the handful of experts advocating human cloning. Is Dolly old before her time?